CANTON, Mass. – Canton head coach Dave Bohane and his team heard the whispers. After a dominating win by Stoughton on Thanksgiving last year, and a shutout over Canton during the regular season earlier this year, the Black Knights had won seven of the past eight meetings, and for straight on the holiday. And by the the way the Bulldogs played on Thursday morning, neither could they. In its best game of the season, Canton scored a 27-0 win over the Black Knights. It marked the first since on the holiday since 2012, and first win at Veteran’s Memorial Field against Stoughton on Thanksgiving since 2003. A suffocating defense limited the Black Knights to less than 100 yards, and became the first group to shut out Stoughton since October 2010. The Bulldogs’ defense looked as though it had been ready for this game all year, allowing just 36 yards total in the first half, with 27 of them coming on one play. It forced Stoughton into a three-and-out to start the game and the offense came through right away. Highlighted by a 25-yard run from senior Alec Ragusa (15 carries, 102 yards, touchdown) and a 10-yard pass from sophomore Johnny Hagan to Ryan Lentol on fourth down, the Bulldogs marched 67 yards on nine plays. Hagan capped the drive, eluding a pair of Stoughton defenders on a 22-yard scramble into the end zone. Owen Lehane’s first of three successful extra points put Canton up 7-0 with 4:33 left in the first quarter. After trading punts, Stoughton’s third drive of the game was halted by a turnover on just the second play. After Justin Ly scampered for 27-yards on first down, the Black Knights fumbled on their next play, and Ragusa quickly scooped it up and sprinted 45-yards for a touchdown and a 14-0 lead with under a minute left in the first quarter. 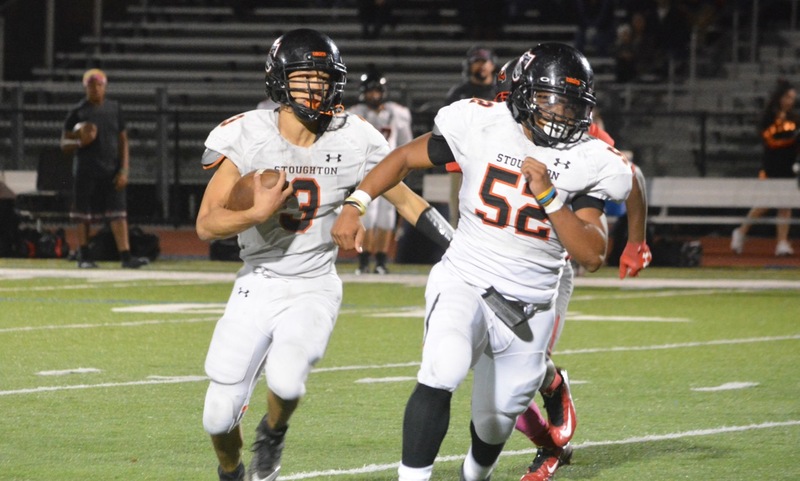 Stoughton’s offense continued to struggle to move the ball against the Bulldogs. On third down of its next drive, junior Evan Gibb was sacked by Ragusa and the Knights were forced to punt. Canton took advantage of a short field two series later. It took the Bulldogs just five plays to cover 34 yards, with Ragusa capping the drive with his first rushing touchdown of the day from four yards out. Junior Brendan Albert put an end to Stoughton’s final drive of the half with a sack on third down. Canton took the 20-0 lead into halftime. The Bulldogs’ defense held Stoughton to just three first downs all game, and didn’t allow a third (0-for-8) or fourth (0-for-1) conversion. Canton took advantage of its defense right away, scoring on its first drive after Stoughton was forced to punt to start the game. The Black Knights’ defense came up with a big three-and-out stop to open the second half but Canton’s defense responded with a huge stop on third and one and got the ball back for its offense. The offense rewarded the defense with its longest drive of the game, covering 70 yards in nine plays before finding the end zone again. Sophomore Gersom Rivera (nine carries, 66 yards) got the drive started with a 32-yard dash, and, despite a holding penalty, Hagan moved the chains with a 21-yard run of his own. The Bulldogs went with four straight running plays, the last a QB option that Hagan kept and extended over the goal line while being tackled to make it 27-0 late in the third quarter. Stoughton’s offense moved into Canton territory for the first time on the final play of the third quarter, but three plays into the final frame, the Black Knights were forced to go for it on fourth down. Canton senior Tony Harris jumped the quick out-route and intercepted the pass, returning it 29 yards to get the Bulldogs the ball back. Canton football finishes the season 5-6 overall, with half of their losses coming by less than six points. Stoughton finishes the season 6-5. NORTH ATTLEBORO, Mass. – Playing a team for a second time in the season presents plenty of obstacles, and more often than not its a tighter game than the first time around. That makes North Attleboro’s dominant 35-12 win over Stoughton in the D3 South Semifinals that much more impressive. 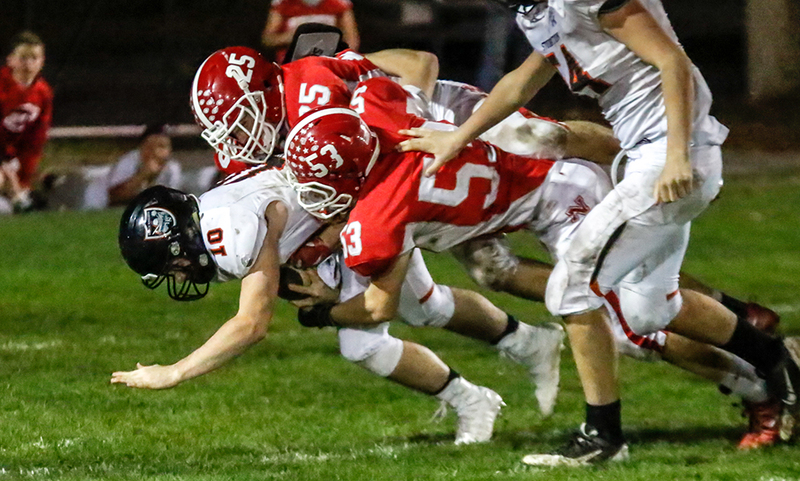 Big Red’s defense limited Stoughton’s starting unit to under 100 yards of total offense, and its offensive unit took advantage of strong field position to advance to the sectional final for the second straight year. Four of North Attleboro’s five touchdown drives required five plays or less, all four of them under 50 yards. Only one drive – the third scoring drive of the game at the end of the first half – was a lengthy possession (seven plays, 65 yards). It wasn’t an ideal start for the Rocketeers, who were forced into an early punt that was blocked by Stoughton’s Jason Joseph and recovered by David Bell. That set Stoughton up at the North Attleboro 20-yard line. But North Attleboro’s defense stood tall with senior Geoff Wilson sacking Stoughton quarterback Johnny Medina on third down. Medina’s throw into the end zone on fourth fell incomplete and North escaped unscathed. Stoughton’s defense did its part again, forcing another punt from North but this time the Rocketeers had a big break. Devin Slaney’s long kick got a kind roll and Stoughton’s returner wasn’t able to cleanly field it, allowing North junior Cam Cornetta to pounce and give the Rocketeers the ball at Stoughton’s 10-yard line. Big Red took advantage of their opportunity and senior quarterback Chad Peterson (5/9, 68 yards – seven carries, 33 yards, three touchdowns) used an option play to keep it himself and run it in from five yards out. North led 7-0 after Wilson’s extra point with 3:05 left in the quarter. “Sometimes it takes a bad play to kind of spark the team, offense or defense either one,” Johnson said of the blocked punt. “And I think that’s exactly what happened there. Slaney’s deep kickoff forced Stoughton to start inside its own 20-yard line. And North’s defense did its part, forcing losses on both first and second down. After a punt, North started at the Stoughton 45-yard line. Peterson hit Nick Raneri for 11 yards then ran for eight yards with a late hit tacked on. Two plays later, North faked the jet sweep and Peterson kept it himself, going in from three yards out and a 14-0 lead with 10:20 to play in the second. Ryan Gaumond put a halt to Stoughton’s next drive with an interception but the Black Knights’ defense allowed just one yard on North’s ensuing drive and got the ball back with a punt. Junior Evan Gibb, who was hurt in the first meeting between the two teams and missed the past two weeks, took over under center to start the second quarter. On Stoughton’s next drive, he rushed for eight yards, then hit Alex Iverson for a 19-yard gain and a first down. Two plays later, Gibb hit Ruben Gonzalez on a hitch route and the senior slipped through a tackle and attempt and raced 41-yards for a touchdown, bringing Stoughton within 14-6 with 3:47 left in the first half. But that was enough time for North to orchestrate its longest drive of the game. Back-to-back passes from Peterson toMario Bresko moved the chains, and two plays later Peterson hit Raneri out in the flat and he raced 29-yards. Two plays later, Nathan Pearce (eight carries, 53 yards) followed a great block up the middle and burst his way through two Stoughton defenders at the goal line for a 16-yard touchdown and a 21-6 lead with 90 seconds left in the first half. Pearce led the Warriors in carries and rushing yards. With Stoughton’s defense bottling Raneri up, and Brendan McHugh without a carry, Pearce provided a spark for the Rocketeers. Stoughton got the ball to start the second half but another nice kick from Slaney, plus a block in the back, forced the Black Knights to start from their own six-yard line. After gains on first and second down, Wilson and Pearce combined for the sack on third down and the Black Knights had to punt from their own end zone. That meant good field position for Big Red once again, starting at the Stoughton 28-yard line. Pearce had three carries for a total of 26 yards, and Peterson capped the drive with a two-yard plunge on fourth down with 6:10 to play. North’s defense again held court and even though Stoughton got off a strong punt, Gaumond had a 33-yard return and North started at the Black Knights’ 17-yard line. With Raneri at quarterback, he ran for 10 yards on first down, and then McHugh burst around the edge for a seven-yard touchdown on his first carry. North led 35-6 with 3:10 left, spelling the end of playing time for its starters on both sides. “We couldn’t get the field position, we couldn’t move the ball…and they sort of stuck it to us,” said Stoughton head coach Greg Burke. “We have to be able to keep it close so we can run the ball. We got plenty of yards the last time, this time they did a couple of different things. Stoughton’s Justin Ly scored on an 11-yard run with 8:56 to play to cap the scoring. With the win, the Rocketeers get a rematch with Duxbury in the sectional finals. It’s the third straight year that Big Red has faced off with the Dragons, with the latter coming away with wins both times. The game is scheduled for Friday night, November 10th at Community Field at 7:00. MILFORD, Mass. – Twenty minutes into Friday night’s regular season finale at Milford High, Stoughton had only managed three first downs. Another short drive came to a close after Jonathan Medina was sacked by several Hawks and offensive lineman Malachi Green-Hightower was forced to jump on a fumble to keep the possession alive. Paul Feeney hit a towering punt downfield towards Ryan O’Toole, who was unable to come up with it cleanly. Matthew Hadley pounced on the loose ball and put the Black Knights at the Milford 25. On the next play, Justin Ly bounced outside the tackle and raced down the Milford sideline for a 25-yard score with 1:31 left in the first half. The score turned out to be the game-winner, as the Black Knights defense smothered the Milford offense, limiting the Hawks to only eight first downs in the game (only three in the second half), in a 14-3 victory that sets up a three-way tie for second place in the Davenport division and most likely a home game for Stoughton in the Div. 3 South playoffs. Milford started the game in a spread formation with sophomore Colby Pires (7-16, 118 yards) in the shotgun. 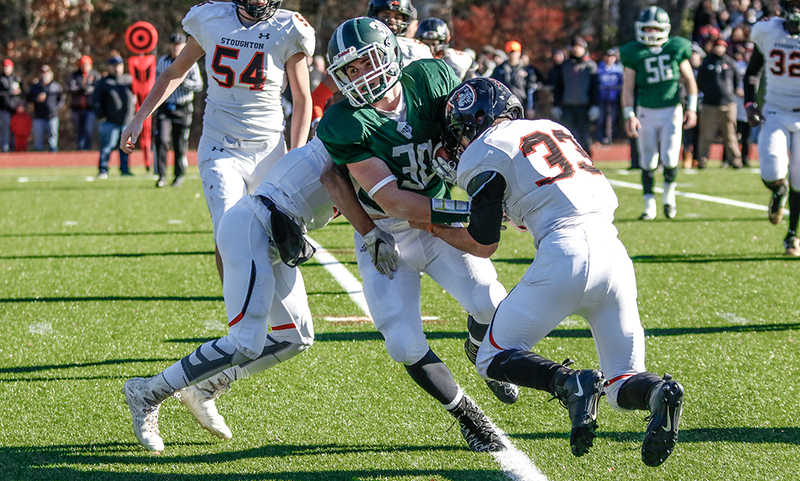 On the first possession of the game, Pires hit Shapel Feaster for 20 yards and the Hawks moved the ball into Stoughton territory, but on fourth and nine Pires scrambled and hit Lucas Rosa for eight yards and the drive stalled at the Black Knights 29. On the second possession, backed up to their own 11, the Hawks hit their biggest play of the game. Pires looked deep down the near sideline to Joey Everett, a senior who transferred in from St. George’s School (Newport, R.I.) midway through the season, and the wideout made an incredible 41-yard catch just keeping a foot in bounds. On the next play, Pires was intercepted by Ryan Semler. The Black Knights went into the locker room with energy after the late touchdown, but in the end both defenses were too strong to keep the momentum going. A sack by Josh Ligor ended the second Stoughton possession of the third quarter and gave Milford the ball back at its own 30. The Hawks turned to junior Ryan Pearl at quarterback in a compact power set that worked the week before in the comeback win over Foxboro. A six-yard completion to Will Pointer got a rare third down conversion for a first down and Pointer followed it with a 20-yard burst around the end. Once again the drive stalled, but Milford turned to junior kicker Sean Lehane, who split the upright with a 46-yard boot (with room to spare) that cut the lead to 7-3. The home crowd was starting to get into it, especially after Ruben Gonzalez was stopped on the kick-off return at his own 17, but the Black Knights settled down and put together the best drive of the game. Alex Sjoquist (15 carries, 91 yards) was the main threat, getting the ball eight times during a 13-play, 83-yard march that took seven minutes off the clock and sealed the win. The big play was a 41-yard burst straight up the middle from Sjoquist that Tyler Joyce kept from being a touchdown with a diving, shoestring tackle. In the end, Sjoquist plunged into the end zone with a three-yard score. Any hope of another late comeback by the Hawks was dashed by a Colin Sanda interception. Despite the defeat, it looks like Milford (3-4, 3-2) has qualified for the Div. 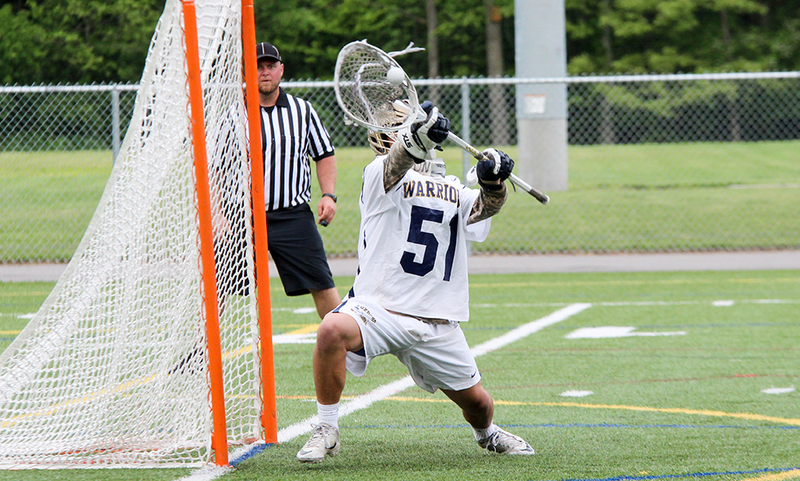 3 South playoffs and could face possible trips to North Attleboro, Duxbury or Hingham. Vizakis is proud of how far the Hawks have come from the opening game of the season. 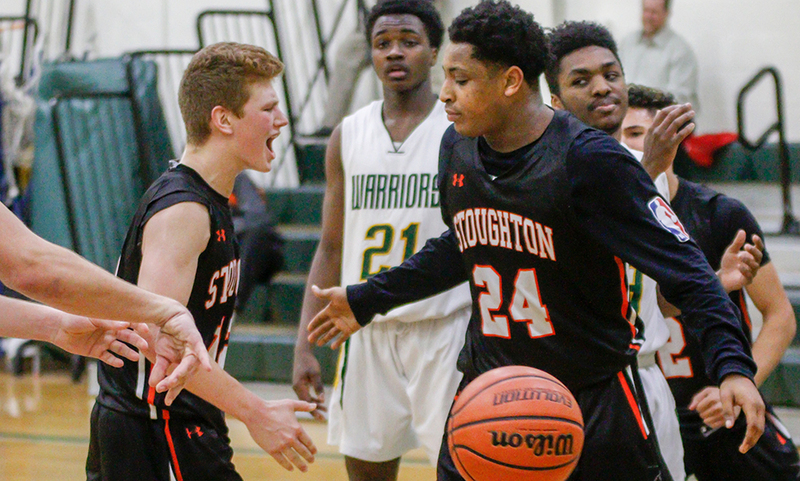 Stoughton (5-2, 3-2) appears to be in line for the third or fourth seed in Div. 3 South.